Greta agrees to the therapy and the results are, to say the least, unexpected: her treatments place her in one of three years: 1984, 1941 or 1918. Greer handles these time changes matter-of-factly; there’s no attempt to explain the details of how Greta travels. In fact, Greta doesn’t so much return to her past – after all, 1918 and 1941 predate her birth – as she does witness three different versions of herself. 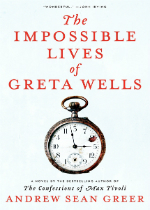 There are echoes of Bob Smith’s Remembrance of Things I Forgot in Greta Wells, but unlike Smith’s protagonist, Greta hasn’t forgotten anything from the past because it’s not a past she experienced. There’s nothing to forget. Yet at the same time the past isn’t completely unfamiliar to Greta: she finds herself in New York City with people of her 1984 life. The home she goes back to is both recognizable and foreign. For the most part, Greer allows his characters, rather than literary style, to carry the novel. Because the tone of Greta Wells is so consistent, Greer’s occasional flourishes (days are “washed away like a castle on the beach”) can feel bumpy and clichéd. And while not all the transitions between time periods are seamless, the sweep of the novel is impressive. Greer refuses to weigh his story down with period minutiae, but rather finds details that feed our imagination like “the sound of a steam whistle, and the clattering of hooves.” He doesn’t so much recreate the three eras as he does quietly evoke them.